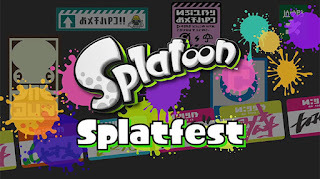 The Block Fort: Let's talk about Splatfest! 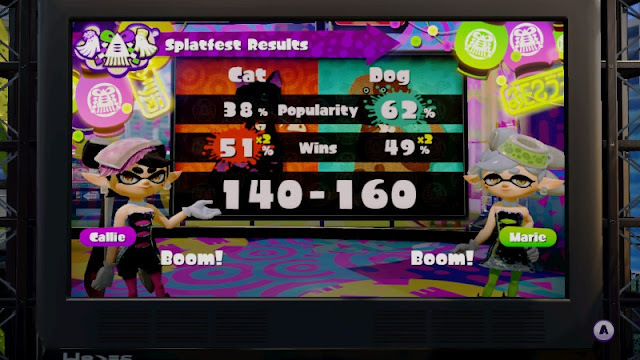 Yesterday, Millions of Splatoon players picked a side, and fought valiantly to prove once and for all who was the superior domesticated animal. Cats or Dogs. But before I go into my experience, I'll go over the rules briefly for those who weren't able to participate. Before Splatfest, players were able to choose a side, Cats or Dogs. They got an in-game shirt to show their pride. 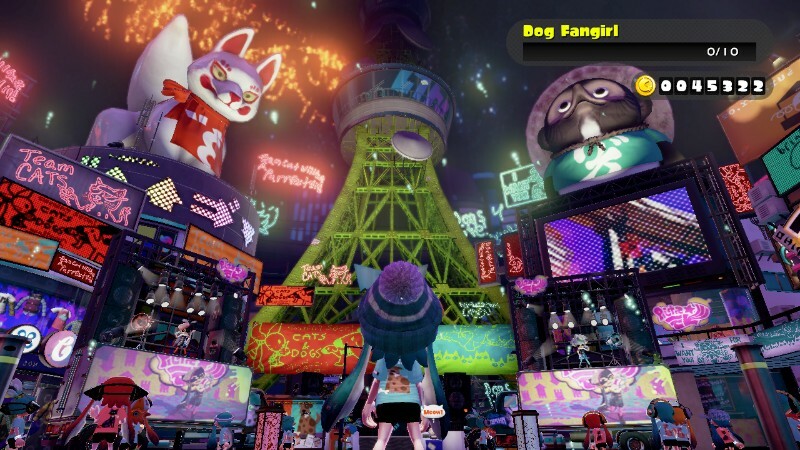 On July 4th, from midnight (PST) to 11:59pm, the entire Splatoon experience changed. Suddenly the plaza was transformed into a big party! Cat v Dog Miiverse posts were everywhere, and all the music was different. It was pretty cool. Everyone playing Splatoon that day played Turf War against their rival side. Dogs fought Cats and Cats fought Dogs. 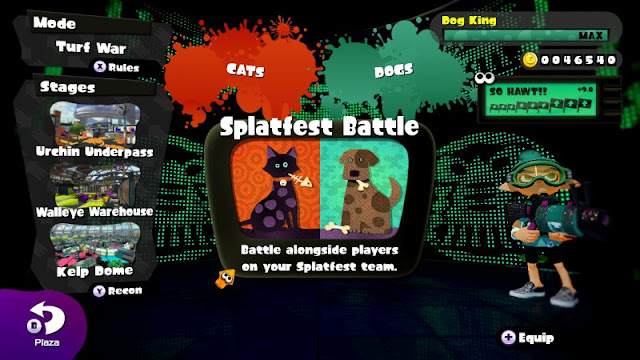 I went into Splatfest with what a pretty good idea of what was going on. I spend a good amount of time online researching whats happening with the games I play, So I didn't know exactly how unprepared for the experience I was. Overall I did very well! How did you fare? Community! Rallying behind my team (Dogs), and seeing all the Miiverse posts was really fun! And it made the matches feel more important. Which made me REALLY upset when I lost. It was also cool that the music was changed up, it made the day feel special to have the entire game celebrate with me. There was a concert in the plaza, fireworks, and even Judd was gettin' down! When I found out that my team won, I was ecstatic! I won 24 Sea Snails because I made it all the way to rank Dog King (the highest rank achievable). Sea Snails are used to upgrade your gear. Overall it was a super fun experience and a great way to keep people playing. I was surprised that the map rotation was so limited. We got the same 3 maps for 24 hours, and after a while it got a little old. I wish they had just kept the 4 hour rotation going. Other than that, I have no complaints about the event itself. The aftermath however was less than stellar. My team won! But not in the way you think. Dogs were significantly more popular, and I'm still not sure if that meant we had more Miiverse posts, or more Team Dog members. Cats however, won slightly more matches then Dogs did. Wins count for twice as many points as popularity (hence the yellow "x2" above the percentages). And the final point score on the bottom = popularity + wins*2. So, Dogs won because we were more popular. So even though I won, it feels like a weak victory, and a lot of Cat fans around the internet are upset about it. I personally didn't even know that popularity was a factor, so I understand why the Cats are upset. I'll try to get more information on what exactly "Popularity" factors in. I can't wait until the next Splatfest! It's an interesting and unique way to keep Splatoon fresh for the masses. It's unfortunate that there wasn't better communication on Nintendo's part about how everything worked. My hope is that Team Cat doesn't feel so robbed that those players don't return, and that Team Dog realizes just how slight our win was. What did you think of the first Splatfest? Got a problem with something I wrote? let me know in the comments! I'd be happy to continue this discussion with you.